What better way to start off a Monday morning than with a little devotion and a low calorie muffin? Some bread to feed your belly and some scripture to feed your soul. Make sure you check back next monday for some more Monday Morning Muffins! It was a normal day in Kindergarten - hectic, as always. As usual, I wolfed down my lunch in 10 minutes and ran out to meet my 20 little five-year-olds in the hallway. After throwing away their trash and dispensing of their tray and silverware, they would make their way into the hallway one by one. As they came out, I was handed the clipboard and the lunch basket; with my lunchbox and water bottle already in hand, I was getting quite bogged down. "I don't think I can carry all this," I said, trying to balance my load without dropping anything. "Well, then it's a good thing you have me!" replied Bryson. He was elated to carry the lunch basket for me and another student happily took the clipboard. It took the simple words of an eager to remind me that I didn't have to do it on my own - that I had 20 little helpers who desperately wanted to help. Isn't this just like us sometimes? We think we can carry it all on our own and try so desperately to balance it all without dropping everything. We forget all along that God is there, anxiously waiting for us to hand it over to him. Try as we might - we just can't do it on our own. It's hard to lose control and hand it all over (easier said than done), but what a relief to know that we don't have to do it on our own. I don't always understand my circumstances, but I do know that I serve a God who will uphold me in my darkest hour. I was looking for a new recipe for Sunday brunch and I found this recipe at SparkRecipes! It is a little involved, but was well worth the time. Mine didn't turn out exactly like the ones in the picture on the website, but they were still very good. 1. Preheat the oven to 350. Line 18 muffin cups with liners. 2. Combine the eggs and brown sugar and a bowl. Mix on medium speed with a hand mixer for 2 minutes. Stir in the carrots, zucchini, oil, and orange zest. 3. Mix the dry ingredients together with a fork (cinnamon, baking soda, baking powder, salt, and flour) and then add to the wet mixture. Mix with the hand mixer until just combined. 4. Divide the batter evenly among the 18 muffin cups. Bake 18-20 minutes. Allow to cool for 10 minutes in the pans, then transfer to a wire rack. 5. Prepare the icing by whisking together the confectioner's sugar, orange zest, and orange juice. I would only add the 2nd tbsp of orange juice if needed because mine turned out a little bit thin. After the muffins have cooled, top each with 1 tsp of icing. I wondered how my family would like them, but they got my 4-year-old niece's stamp of approval! I heard a loud declaration of, "I love these muffins!" Not many were left over after brunch. 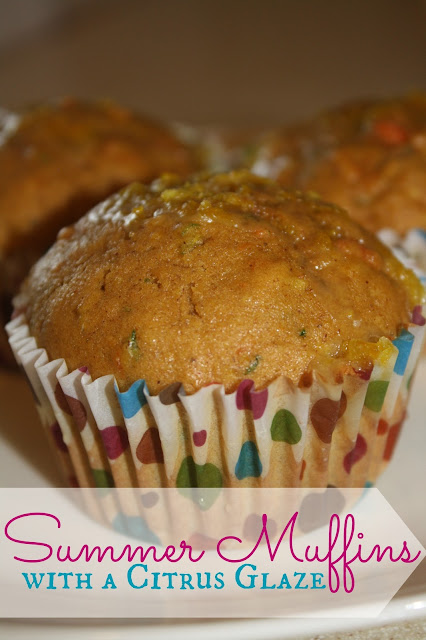 These muffins look great; I'm definitely going to give these a try! This is such a great idea. Muffins and a devotion to start off the week. Wow! These muffins look completely YUM!! I can't wait to try these. Thanks Allison!! Pinning so I can add these to my weekend breakfast baking!